EPA’s new ambient air quality proposal targeting reduction of particles measuring less than 2.5 microns is apt to continue driving air pollution technology at stationary sources. Here’s a review that should stir up the ongoing debate as to which particulate catcher to select, a new breed of electrostatic precipitator or a baghouse. The 1990 Clean Air Act continues an environmental revolution started by the original Clean Air Act – the unceasing pursuit of tighter emissions control based on improving technology. In fact, the pursuit will never stop, since humanity will never stop developing new technologies. And, while individual facilities or industries might complain about the unfairness or cost burden of one specific set of rules, there really is no debate or question about the desirability of reducing the billions of pounds of toxic chemicals that are emitted into the air every year. So, research firms and public interest groups and air pollution control vendors alike continue to focus on improving technology and finding a better solution to air emissions problems. This article discusses some of the emerging solutions for control of particulate matter in industrial exhausts. There is, of course, a new emphasis on this task. The new emphasis results from both recent studies suggesting that submicron particles cause most of the illnesses associated with air pollution, and EPA’s reactionary proposal to revise the National Ambient Air Quality Standards (NAAQS). EPA’s proposal, which is due for finalization this summer, included the first limits for PM 2.5-particulate matter with a mean diameter of 2.5 microns or less. The Importance of Capturing Fine Particles: Why is the capture of particulate this fine important in the removal of toxic substances from industrial exhausts? High temperature incineration, boilers, metal smelters and other industrial processes emit vapors containing volatile metals or their compounds such as arsenic, cadmium, nickel, cobalt and lead. Upon leaving the combustors, flue gases containing these constituents are cooled to remove thermal energy. In the process of cooling, the toxic metals are condensed to form extremely fine, submicron particles-particles smaller than 1 micron. (For comparison, a human hair is about 100 microns thick). The toxic compounds from combustion are also condensed upon the surface of ash or other particles in the exhaust gas. For a given total mass of particles in the air stream, the surface area of smaller particles is much greater than the surface area of larger particles. One gram of 0.1 micron particles has 10 times as much surface area as a gram of 1.0 micron particles (60m squared vs. 6m squared). Toxic vapors condense uniformly on the surface area of all the particles. That is why capturing a gram of 0.1 micron ash particles is ten times more effective at removing toxics than capturing a gram of 1.0 micron ash particles coming out of a combustor. The fact that submicron particles penetrate more easily into the lungs and into the bloodstream of humans and animals makes their capture and disposal more important. Physics of Particulate Removal: Having answered why fine particles are an important target, a review of technologies that can be used to capture it is in order. Selecting an air pollution control (APC) device begins with a thorough analysis of the relevant emission parameters, including volumetric flow rate, the temperature of the exhaust gas to be treated, moisture content, particulate concentration and particle size distribution. Of these parameters, particle size is the most important when selecting a control technology for an exhaust stream that contains solid or liquid matter. The particle must be forced into contact with a boundary surface so that its motion can be completely arrested by the surface forces. Those surface forces must be great enough to keep the particle from being re-entrained (pulled back into the gas stream), or all the forces applied should cause the particle to move directly to a receptacle beyond the influence of the gas stream. Small particles tend to follow the speed and direction of the gas carrying them unless acted upon by a force of separation, creating particle movement or displacement. Table 1 shows particle displacement due to forces of gravity, centrifugal force, electrical impulse or Brownian, for different size particles. Particles 10 microns in size and smaller do not respond effectively to gravitational forces. As such, settling chambers are usually not specified for particles smaller than 50 microns, even though they might be part of an APC system to reduce the number of large particles ahead of treatment with a venturi scrubber, a fabric filter or an electrostatic precipitator (ESP). Additionally, in a settling chamber, gas flow undergoes an abrupt and substantial velocity drop due to the increase of the cross-sectional area. When a suspended particle travels In a circular path, it is acted upon by centrifugal forces and moves radially outward. The centrifugal force is directly proportional to the particle mass and tangential velocity to the second power, but it is inversely proportional to the radius of the turn that is, the smaller the radius of the turn, the bigger the force. That is why equipment utilizing these forces, cyclonic separators, are more efficient in small diameters. For particles less than 5 microns in size, however, centrifugal separators become impractical, as they require excessive energy consumption from blowers trying to push air through the separator. 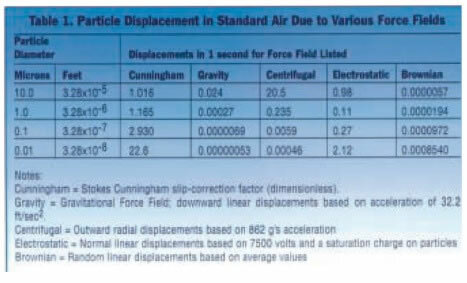 Electrostatic displacement, or migration velocity, actually increases with decrease in size of the particles. This dramatic phenomenon, along with a few others, places electrostatic precipitators at the forefront of technologies for capturing submicron particles. More details on the use of ESPs in lieu of, or in combination with, other APC components follows later in this article. Particles smaller than 0.1 micron in diameter exhibit a significant random movement called Brownian motion due to collisions with individual gas molecules. The average linear displacement, ΔX (in feet), of a particle suspended in the gas and subjected to the bombardment of the gas molecules is a function of the particle size, dp (in feet), and various gas properties. This displacement, also known as a Brownian motion, can be calculated by an equation that Albert Einstein developed in 1905: where: Ru is the universal gas constant (1 ,545 ft-lb/lb m-mol°F) , T is the gas temperature (°R), u is the viscosity (lb m/ft-sec) , N is Avogadro’s Number (2.76×10 to the twentysixth lb m-mol), the time interval (sec), and Cc is the Cunningham-Millikan slip-correction factor. This equation demonstrates that the velocity of the particle is a function of its size, the gas temperature and the gas viscosity. Thermophoresis will take place when the gas temperatures on opposite sides of a particle differ. Gas molecules on the warmer side have a higher kinetic energy, and so they’ll strike the particle with more force than will molecules on the cooler side. This unbalanced striking force causes the particle to move away from the warmer temperature zone. The velocity at which the particle moves depends on the temperature gradient across the particle, the relative thermal conductivities of the gas and particle, density and viscosity of the gas. Diffusiophoresis will take place when the partial water vapor pressure in the carrier gas is greater than the water vapor pressure at the surface of the water droplets of scrubbing liquid. In this case, water vapor will condense onto the droplets. A bulk motion of gas toward the droplets is created to replace the condensed vapor. This gas movement sweeps the particle toward the droplet and impinges the particle upon the droplet. After the contact occurs, mechanical removal of the combined droplet/particle is easier, since they will be removed according to the same principles indicated in Table 1. In other words, the bigger the droplet/particle, the easier it is to remove. Because the droplets are larger than the particles and are easily removed, diffusiophoresis can have a significant effect upon the collection of fine particles. There is a practical, workable limit to the size a water droplet should be in air pollution control systems, however. The same volume of water in smaller droplet sizes offers more surface area and more opportunity for interacting with particles in the gas stream. But if droplets are too small, the particles and droplets are swept along in the gas stream independently of one another without interaction. Research shows that the most efficient removal of particles on water droplets occurs when the droplet size is 15 to 20 times larger than the particle to be scrubbed. 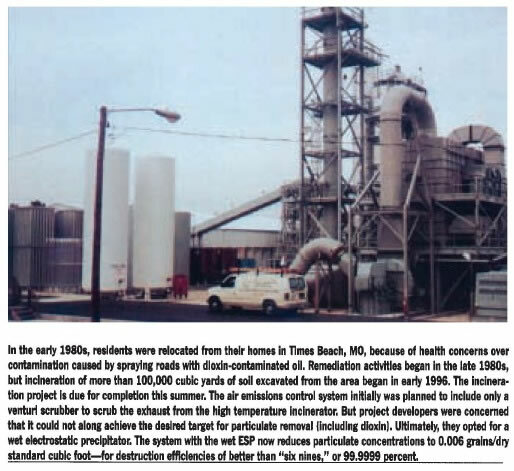 Equipment Options: In the 25 years following passage of the original Clean Air Act, several technologies were developed to manage particulate control. In fact, the early control technologies focussed on particulate matter, since limits for acid gas and other target pollutants only arrived in relatively recent revisions to the original CAA. The key to developing an effective removal system is to understand the limitations of each component in a given application. For example ,fabric filters (also called baghouses) , especially pulse jet types, provide inherently very high removal efficiency on fine particles. However, their application is limited by the chemical and physical nature of the particles and pressure drop of up to 20 times more than ESP. If the particles are hydroscopic and/or have a tendency to solidify on the bags, or are wet and stick to fibers, the fabric filter cannot be used. Fabric filters also operate hot (350-400°F) and therefore will not remove gaseous pollutants and uncondensed organic vapors, unless it is combined with spray dry scrubbers which further complicate temperature control systems and waste disposal. 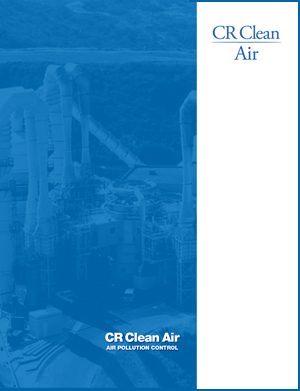 Another traditional method of air pollution control is the venturi scrubber: Venturi scrubbers work well when treating moist gas or liquid particulate larger than one micron. As such, they are effective when used as part of a complete system to pre-treat gas. However, separation in venturi scrubbers is based solely on the impaction of particles with water droplets. To generate the proper size water droplets for removing submicron particles would require operating with extreme pressure drops, making the system too costly in terms of energy-consumption. 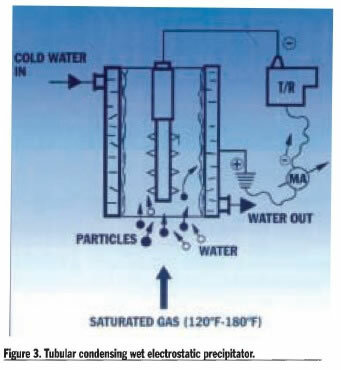 Electrostatic precipitator’s separate suspended particles from a gas according to three fundamental steps: electrical charging of suspended particles by gaseous ions produced by corona discharge; collection of the charged particles in an electrical field on the collecting electrodes; and removal of the precipitated material from the collecting electrodes to a storage area outside of the ESP. 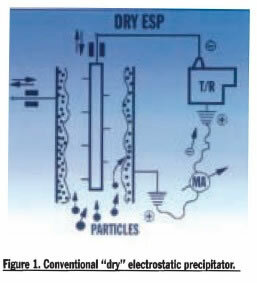 (Figure 1 illustrates a conventional ESP, which in the following will be distinguished as a “dry” ESP. Also, see the accompanying box for a discussion of the importance of maintaining the electrical field forces). The ESP has been a work horse for fine particle removal for power and process industries for many years, having removed millions of tons of fly ash from coal fired boilers. Despite a high capture efficiency, however, the conventional “dry” ESP designs have limitations due to dust resistivity. The dry ESP performs well only when the dust deposit on the collecting plates has a resistivity greater than about 10 to the seventh ohm-em, but less than 2×10 to the tenth ohm-cm. If the resistivity is less than 10 to the seventh, the forces holding the dust particles on the dust layer or plates is very low and re-entrainment of particles can become a problem. Especially, when shaking the collecting plates during the rapping cycle, the re-entrainment can lead to significantly lower collection efficiency. If the resistivity is higher than 2×10 to the tenth ohm-cm, the voltage drop through the dust layer to the grounded plates can become significant, resulting in the breakdown of the “back corona” and again, a lower collection efficiency. Industrial exhausts, which contain a substantial amount of condensable VOCs and acid gases in addition to the solid particles, represent another challenge for dry ESPs. Dry ESPs operated above the condensation of these vapors cannot be used as the sole emissions control equipment. They must be used in combination with scrubbers or other equipment. In some cases, a complete system becomes cumbersome and expensive to install, run and service-when a single component system might suffice. Wet Electrostatic Precipitators are a relatively new particulate control option that may serve well in many applications for single component air pollution control. In a “wet” ESP, particles are removed by directing a stream of liquid (usually water) at the collecting plates, reducing the incidence of re-entrainment and providing a more consistent collection efficiency. (See Figure 2). Gas requires substantial cooling to reduce the volume of the exhaust. High moisture content in the gas. The gas stream has already been treated in a scrubber but needs additional removal of fine particulate and acid droplets. The collection of submicron particulates is required regardless of physical nature and chemistry of collected material. The limitations of even this improved ESP technology are based on the disruptions one might expect when spraying water into a field carrying 50,000 volts of electricity. There is sparking with “washing” and ultimately loss of energy and collection efficiency of the unit. The Ultimate Control Device? : While a variety of wet ESP designs may be competing for attention in the marketplace, wet ESP technology is continually advancing. One advancement has been the development of the tubular, two-stage wet ESP, developed in the early 1980s. This technology makes use of a design that uses separate sections of a tube for charging and collecting particles along a vertical tube, dramatically increasing the collection efficiency while reducing the capital cost of the equipment. Another wet ESP advancement building on the tubular, two-stage concept is a design that uses condensation, rather than water sprays, as the means to capture and collect the particles. This concept of separation is called condensing wet ESP, and is a combination of an air-to-cooling agent heat exchanger and up-flow vertical tubular ESP. 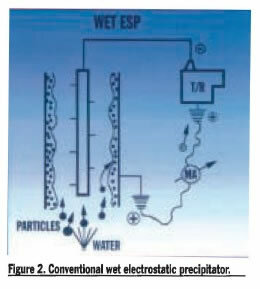 A schematic showing a condensing wet ESP is provided in Figure 3. While developed a couple of decades ago , the number of units in operation is still relatively small. Still, a rapid climb in the use of the technology has been evident during the past 15 years. Hot and contaminated gas from the combustor or other thermal equipment is quenched from 1.800°F to about 300 °F (in a quencher that is supplied with the wet ESP system). The gas is further cooled to full saturation (140°F to 170°F) and precleaned of all the particles above 2 microns in a low energy prescrubbing section of the wet ESP. Saturated gas flows upward through the tubes. An ionizing electrode runs down the center of each tube. A strong electrical field is generated in the charging portion at the bottom of the tube. The electrode is a rigid metal structure with sharp points for the corona current discharge. As particles pass through the gap between the sharp points and walls of the tube, they are intercepted by negatively charged gas molecules moving towards the positive tube walls. These negatively charged gas molecules or negative ions accumulate on the surface of the particle; ultimately, the particle becomes fully saturated with charge. As the gas with charged particulates passes up in the tube, it enters the collection section, where there are strong repelling forces. The strong electrical field causes the charged particles and entrained droplets to migrate to the inner surfaces of the tubes. In wet condensing ESPs, the walls of the collecting tubes are cooled on the outside by a water jacket, causing a film of condensed moisture from the saturated gas to form on the inner surface of the tubes. In the conventional wet ESP of up-flow designs, water droplets from the bottom spray (40 microns in size or more) never reach the upper portion of the tube where most of the submicron particulate accumulates. This leads to the need for frequent wash down of the ESP with top wash nozzles, which requires the shut down of the ESP. In contrast, a condensing type is continuously self cleaning and consistent for the whole tube height. The water film created on the walls of the tubes flush collected particulates down and out of the tubes. An extra advantage of a condensing wet ESP system is the potential for water recovery. Some of the water vapor condensed from the exhaust gas can be recovered, resulting in up to 30 percent reduction in water makeup requirements for the scrubbing compared to conventional wet plume scrubbing systems. It should also be pointed out that while many dry collection system vendors suggest wet ESP systems create the problem of liquid waste disposal, wet ESP systems can be easily converted into cost-saving, zero-discharge systems. The wet wastes from the ESP can be cost effectively recycled through incorporation of an evaporation system that makes use of the process heat. (Most systems creating and seeking control of submicron particles are high temperature combustion processes.) The continuous bleed from the recycling system is directed into the spray dryer to be evaporated by the hot gases from the process. Conclusion: There are several mechanisms that govern particles in a gas stream. Each technology developed for particle control makes use of one or more of these mechanisms. The best of the future of particulate removers, especially for fine particles, will likely use a combination of forces-mechanical, electrical, magnetic, thermal energy-to accomplish the task for a wide variety of air cleaning applications. Hence, electrostatic precipitators of advanced design are apt to continue emerging as the preferred system for removal of difficult submicron particulate from industrial emissions, but careful review of all the competing technologies is essential before selecting the unit to manage the task for your facility.